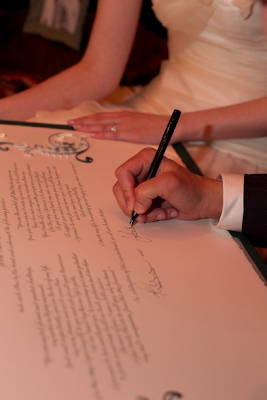 Earlier this week I mentioned having had the pleasure of creating a marriage certificate for a Virginia couple. Kristyn, the bride-to-be, contacted me several months before the wedding. We worked closely to obtain the exact look she had in mind. Kristyn told me she has always loved chandeliers and that their invitation would feature one... she asked if I could quill a chandelier as part of the design. By coincidence, I'd been thinking it would be fun to quill an ornate light fixture someday, but until this opportunity came along, thoughts were as far as it had gone. Using the invitation's graphic as inspiration, I created a chandelier in ivory, pearlized silver, and silver-edged ivory, and placed it top and center on the certificate. For the remainder of the design, Kristyn liked the idea of graceful scrolls to complement the chandelier's structure. 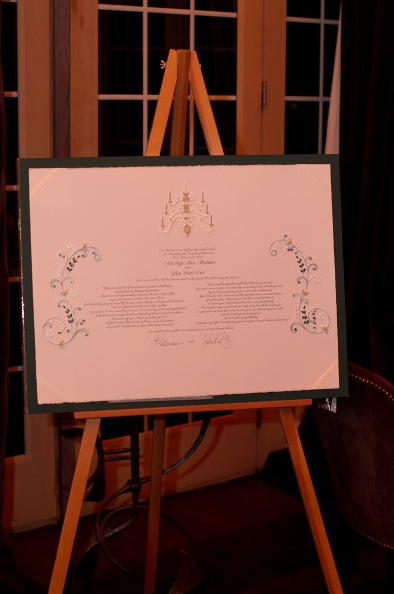 I positioned large S scrolls at the sides of the hand-calligraphed wedding vows, and embellished each with smaller scrolls and leaves. The wedding's elegant color palette was ivory, grey, lamb's ear green, and silver... all of these were used in the design. For those of you who love to quill, read on about a new tool (to me, at least) that helped a great deal in the making of this project. As much as I enjoy creating large designs and doing the actual quilling, when it comes time to glue the coils to a surface... well, let's just say placement is key and it can make for a pretty challenging situation. Because I do the final gluing on marriage certificates after the vows have been lettered, everything has to be in perfect position from the start. There are no do-overs without extra expense and inconvenience. In the past I've measured, measured, and measured again, dotting the certificate with nearly invisible pencil marks that are later erased, but this time I tried what turned out to be a fabulous device - a laser level. Ordinarily one is used as a guide when hanging art work, but what a huge help it is for a project like this. The level shot a clear, red line of light across the entire thirty inch width of the piece, which helped ensure that the curves of the large scrolls were identical. Of course a lot of careful measuring was still required, but the level was just like having an extra pair of hands, and unlike a yardstick, did not get in the way. I collaborated with other artists for this wedding... Riva Brown lettered the marriage certificate and Jenny Jafek-Jones of The Crimson Poppy helped to create a floral hair accessory that was exactly what Kristyn had in mind. If you have found your way here via What Junebug Loves, welcome! How beautiful, Ann. We have one of those laser levels; they're great. Dear Ann, this is AMAZING! This is a piece of art. I know nothing about this tecnique, but I understand that you shoud have great patience! Thanks for sharing with us your crafts. Beautiful quilling work Ann. I was wondering as I was reading how you managed to get your quilling so uniform and if you had back up of the certificate if something should happen ... but you have answered it all as I kept reading. I am AMAZED that I don't see a speck of glue ANYWHERE in the pictures. Wow Ann- It's just gorgeous!!! Great job! This is a piece of art Ann!! and... I´m very sure it will be cherish for ever. I always love to visit your blog and learn with you!! :))) You are an example for everyone who wants to be a quiller. Your job is so elegant, perfectly done and it is always STUNNING!!! Thanks a lot for sharing your talent with all of us!! You create really beautiful quilling pieces. I adore reading your posts. Thank you! wow! that is amaizing! very hard job! But the result is wonderful! You've made a masterpiece!!! Beautiful! I like it a lot! Ann, you are amazing! Your talent not only shines through your artistic touches and ability, but through the genius of the craft side as well -- how precise, how calculated, how utterly perfect. My jaw dropped, big time. Well done. Thank you for showing off your incredible work! The chandelier is AMAZING, as are the graceful scrolls. How do you manage to make it all so uniform and so clean without compromising on quality and beauty? Simply LOVELY. Spectacular. Amazing. Love the laser leveller, too. Well, what can I say after this magnificent work of art?! Every single part makes this certificate so unique: it's symmetry ( we all know how hard it is to achieve ), design...oh, my...that beautiful, beautiful colors and no need to mention your quilling skills. The photos are great. This is just beautiful. I can relate on the delicacy of a wedding invitation or certificate with no "do overs". I take a deep breath each time I do one. This is so lovely the bride must be thrilled. That is such a lovely and delicate work...It is impressive ! That is just stunning. I love the chandelier. it's gorgeous. Great idea with the laser level. Oh my gosh, that is STUNNING! So beautiful. Makes me wish I knew about quilling when I got married so I could have had something like this! OMG Ann this is so beautiful. The chandelier is spectacular. It must have been a test in patience to get this so perfectly placed. You should be so proud of it.What a great idea to use the laser leveler. This is so fabulous Ann, I just love the chandelier !.The scrolls so beautifully done throughout are so perfect.Using the laser level is such a clever idea. The large S scroll must have been a real challenge. Im in absolute LOVE with this piece! Such great work as always! I recall seeing a feature on this marriage certificate and your awesome quilling work on it. But it's even more jaw-dropping to read your firsthand explanation of the painstaking process. Your quilling creations are true labors of love...and patience! Thank you so much everyone - what a joy to read your comments. Each one is very appreciated. Cheryl, I admit to being a stickler about glue. I try to use as little as possible and find that keeping a damp cloth close at hand to keep my fingers glue-free is essential. Yuenie, I think I just have lots of patience when it comes to quilling and have always been a bit of a neatnik. Being nearsighted is also a plus... probably the only plus of that! Wow, Ann. This is absolutely gorgeous! The chandelier is amazing. And thank you for the tip on the level (and in your comment about a damp cloth for glue!!). Really love this piece. What beautiful, immaculate work! This is fantastic, Ann. And I just love the laser levelling idea - brilliant! Ann both are so beautiful and exquisite! So elegant and you tip about the laser will come in very handy! Oh Ann... this is just fabulous.. your quilling is always perfection.. love it.. that chandelier is amazing..
am sooooo off to get a laser level.. brilliant.. lol.. Exquisite work Ann,you have no peers! Wow ann! this is truly a gift from the heart and labour of love. Just to let you know, we just shared this post on your amazing quilled marriage certificate on our Bellenza Facebook page. Ann, Your work never ceases to amaze me and the laser light level was a brilliant idea. I have tried to love quilling, but always thought it was to homey for me. Your work elevates quilling to fine art and I would be proud to have this wedding certificate hanging in my home. I'm impressed with the colors, the overall design, the scrolls and leaves, and the way you designed the chandelier. It is fascinating to see how you formed the structures. The side scrolls are perfect to compliment the central image. I'm thrilled that the bride had the foresight to request your work and you had the artistic vision to make this unique but gorgeous piece of art. Ann - I love the quilled design on our wedding invitation that you gave to me as a wedding gift. It has stood in its pretty silver frame for many years now. Not sure how many brides have large marriage certificates, but all brides have paper invitations that can be beautifully enhanced with quilling to commemorate their big day and easily preserved under glass as a keepsake. CONGRATULATIONS ANN!!!! I love the whole piece, especially the chandelier!! What a lovely memento for Kristyn and John to have. Your quilling is exquisite!!! Thank you for your comments, everyone - you all are so kind! Fantastic! I love the chandelier so much that I can't even express it in words. And your use of a laser level is so smart! This is absolutely gorgeous and so elegant! I love the laser level, too. What a clever use for a tool. I really enjoy hearing new uses for tools. breathtaking! i'm agog at your patience and exacting detail. it just begs one to keep coming closer. Wow, Ann! This is wonderful! The details are incredible. Lovely, lovely work. I found your blog fron the mention on ScrapScene. Wow, I am floored. Your work is amazing. I have always been intrigued with quilling and have tried a few flowers, but this stuff is amazing. These are really gorgeous. I've never seen anything like this before but would look to have invites and certificates that look like these. And love a good hardware tool put to use in the art studio!! Spectacular! I love it! The level is a brilliant idea too. This is absolutely beautiful- your whole website is inspiring. Thanks Chelsea, and thanks for linking to my site from yours - much appreciated! I'm thinking of dumping Capt America just so I can remarry him and have you quill our certificate. Wow! Just gorgeous!